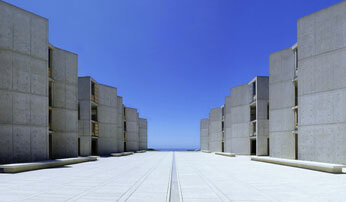 Louis Kahn, renowned American architect, planned the construction of numerous civic structures. Among them was public housing, viaduct systems, and streets and roads in the city of Philadelphia. He did not arrive at his distinctive modernist style till he was in his fifties. His projects since this turning point include art museums, assembly halls and libraries; religious centers and parks; and the Salk Institute in La Jolla, California; and the National Assembly building in Dhaka, Bangladesh, considered the masterpiece of his career. His buildings are a concentration on space and material and weight, rejecting any overt loyalty to historical styles of architecture. We can pursue details of Kahn’s early years, his years of education, his fonts of inspiration, his travels, his visions and his acclaim through biographies of the man and recorded interviews of his admirers and critics, but what more intimate and singular account can we find of a life than through the eyes of a person as profoundly affected and entwined as a family member? Kahn’s son, Nathaniel Kahn, spent several years assembling a narrative of his father after his death. “My Architect” provides a portrait of Louis Kahn that explores the underlying dimensions of a life popularly known but never thus witnessed. Who were some of the pioneers of interior design? Before she became an esteemed novelist, Edith Wharton was a practicing decorator and designer — interests to which she was passionately dedicated. Rather than innovating new styles, however, what Wharton and her collaborator and friend, the architect Ogden Comden Jr., sought to do was re-establish the “grace and timelessness” of home decoration that would stand in stark relief against the tawdry and obnoxious ways families such as the Vanderbilts were flaunting their wealth and status at the end of the 19th century. The pair wrote a book in response to this threat of bad taste, The Decoration of Houses, which remains the keystone among books on interior design and architecture published since. Wharton wanted to educate the rich by promoting the beauty and efficiency of “well-made, well-mannered” spaces and pieces versus what she deemed to be their conspicuous flaunting of the vagaries of the Gilded Age. Among the original recommendations, many still adhere: the sanity and security of investing in comfortable couches and chairs rather than souvenirs and novelties; designing homes that are useful to the needs of its inhabitants instead of overzealously adopting what is currently in vogue; striving for an easy proportionality within a room as a way to nourish inner calm and contentment. Indeed, the sensibility of these ideas remains inarguable. Buildings can be beautiful. They can be ballasts against the elements, safeguarding the lives inside. Their materials can be smartly sourced, and interiors shaped and styled to make the most out of the character and conditions of the natural environment that surrounds them. But what about architecture that is driven by considerations of how its human population can best be aided and supported through the specific features of its design? Our visual faculties connect deeply to our emotions. Colors, for instance, have emotional valences. There are those that conjure feelings of unrest and anxiety; some that promote tranquility. Similarly with shape, dimension, tone and texture — all contribute toward feelings of well-being (or the opposite) as we encounter and interact with these things. This article in Architectural Digest collects the most interesting and successful projects that had that notion in mind: Homes and buildings, inside and out, should nurture and strengthen the lives inside. These architects traveled toward this central idea from various directions — physically, yes, but also politically. The refugee camp in Germany, for example, was designed to foster a sense of community for the residents by creating open and airy meeting spaces inside. This article from Design Sponge collects images of an array of architectural arches, in homes, shops and offices, to remind us that the square doorway is not the only type of threshold we can cross. It is a design that has been used for centuries, and continues to be seen in modern architecture because of its visually pleasing shape, attractive and welcoming. The arch can symbolize many things. From a physical standpoint, it is one of the strongest, sturdiest types of construction, based on the way that the shape allows stress and weight to be distributed and supported. An arch in the home is like a symbol of protection, then, which is a wonderful thing to experience in your personal space. The arch allows motion, while ensuring stability. What about the beautiful image of an arch as a gateway? Crossing through an arch in one’s home can act to infuse both rooms with their own distinctive feeling and purpose, making the passing through from one to the other a special, mindful act. There are even ways to imitate the form, without actually having an arch-shaped doorway. Make one to frame a cabinet’s contents, or even to enhance the warm nature of a bedroom by adding a painting or picture of an arch above the bed. Robert Raushenberg, whose career spanned 60 years and multiple dimensions, has always been a harbinger of what’s to come, and what we should experiment with as human artists — not just creatively, but also culturally. His work often blended a variety of media and materials, presaging the way we synthesize different elements in our world today to create new work, and new functions and ideas. Rauschenberg experimented with photography, sculpture, found objects, text and print to break the rules that governed each discipline and introduce a new palette with which to approach the practice of creative expression. The retrospective of his art, at the SFMOMA until March 25, 2018, illuminates how malleable his vision of collaborative processes was, and how relevant those ideas still are when we consider the broadening reach of technology into art, humanities and design in the present day. The ways we assert ourselves and share our vision (or revision) of the world as we know it, depends on our ability to communicate across languages, perspectives and customs. Robert Rauschenberg saw the environment as a source of inspiration, and sculpted it to become a channel for conversation and growth. By erasing the rules, he built a new discourse of cross-pollination between means and models. In today’s landscape, where all things combine and inform one another, the only rule is to banish the urge to restrain ourselves.